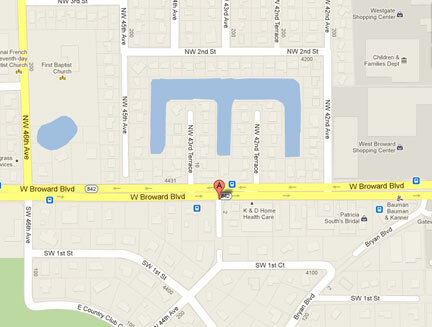 Our Fort Lauderdale women’s center is centrally located and easy to find. From I-95, take Broward Blvd. exit West. Drive approx. 2 miles west on Broward Blvd. Go past State Road 7, also known as State Road 441, approx. 1 block. Stay in the left lane and make the first left at SW 44th Avenue. From I-595, take University Drive to Broward Blvd. and make a right (East). Drive East on Broward Blvd. approx. 2 miles and make a right on SW 44th Avenue. From State Road 7/ State Road 441 Go South on SR7/SR441 to Broward Blvd. and make a right or go North on SR7/ SR441 to Broward Blvd. and make a left. Stay in the left lane and make the first left at SW 44th Avenue.